Since its creation in 1818 by the marriage of Elisabeth Salmon and Nicolas-François Billecart, the House of Billecart-Salmon has remained independently family owned, conserving 7 generations of know-how and the integrity and quality of its wines. The blend of the prestigious cuvées of Billecart-Salmon, with is Collection and Vintage ranges, is carefully achieved thanks to the illustrious varieties that are Chardonnay, Pinot Black and Pinot Meunier, all coming from the best plots of the Champagne region. 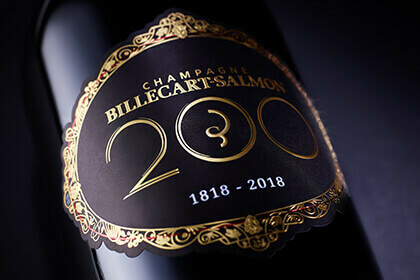 Billecart-Salmon Champagne commemorates its bicentennial anniversary this year with celebrations around the world to share its enchantingly elegant champagnes that have been perfectly crafted over a span of seven generations. Two hundred years of heritage have brought about revolutions in both style and technology from a family that gives priority to quality and strives for excellence in each of its dazzling cuvées. The story of Billecart-Salmon Champagne started when Niçolas François Billecart married Elizabeth Salmon in 1818. Once married, they decided to establish the Billecart-Salmon Champagne House in Mareuil-sur-Äy, the family’s hometown. Louis Salmon, Elizabeth’s brother, then came abroad and dedicated himself to the creation of the House’s champagnes. By the turn of the century, Billecart-Salmon had established itself as one of the grand Champagne Houses. When it took part in the Exposition Universelle in Paris in 1900, it was one of the sponsors of the Palais du Champagne in which its shimmering golden cuvées were served alongside other famous brands. Since then, the House has gone through revolutions in technology with the introduction of cold settling in 1958; and through revolutions in quality with the 1970 inauguration of its Brut Rosé that has become a benchmark for the quality to be expected from a rosé champagne. The 2000s saw more technological revolutions in the winery with the introduction of thermo-regulated tanks to guarantee the traceability of grape varieties and parcels. 2018 now marks two hundred years of the House’s dedication to quality and excellence. 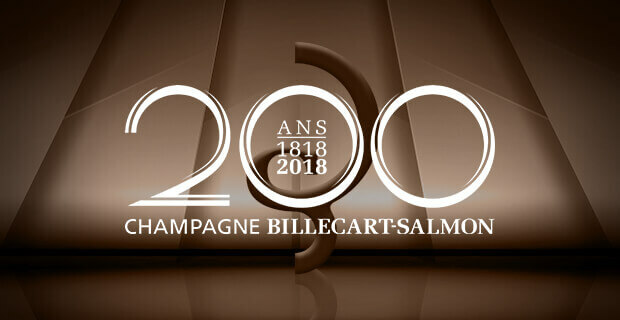 To celebrate its bicentennial anniversary, Billecart-Salmon Champagne is organizing a world tour of gastronomic events with help from three-star Michelin Chef Alain Passard, and is launching an exclusive Bicentenary Cuvée to be shared at those events in Singapore, Tokyo, New York, Los Angeles and London. Other celebrations will also be held throughout 2018 to recognise Billecart-Salmon’s champagne-making methods and to honour its 200-year heritage. Nevertheless, this is not only a family story that spans across seven generations, but it is also a story of continuity in which Billecart-Salmon Champagne continues to uphold its founding principles of finesse, balance and elegance under the motto of “give priority to quality, and strive for excellence”. For two hundred years, the House has remained in family hands with each generation passing down the secrets of their ancestral methods for making exquisite champagne. François Roland-Billecart previously ran the House along with his younger brother Antoine. 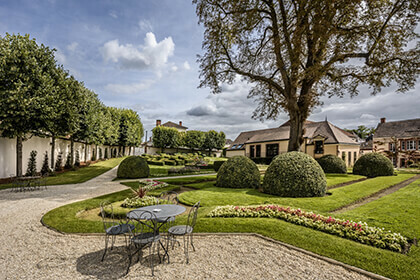 However, Mathieu Roland-Billecart just took over as the House’s seventh generation. Billecart-Salmon Champagne describes its vineyards as those that “grow under the Champenois sunshine” and blossom to the “sounds of nature’s rhythm”. These vineyards flourish on a range of different subsoils. The Billecart-Salmon terroir in Montagne de Reims lies on a deep bed of chalk, the one in Côte des Blancs rests on an outcrop of chalk, and the one in the Vallée de la Marne has soils with more marl, sand or clay. This chalky limestone imparts mineral notes on its champagnes, and it also puts the vines under just enough water stress during the growing season. 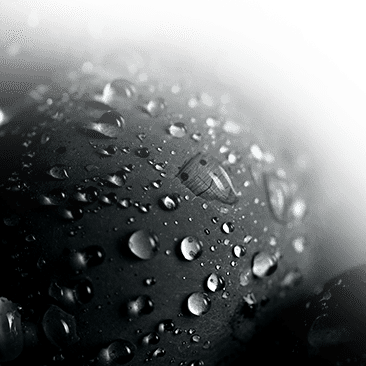 This stress allows the berries to achieve the perfect balance of ripeness, acidity and aromas so that Billecart-Salmon can create its enchantingly elegant champagnes. The Billecart-Salmon House has 100 hectares that it rigorously cultivates on its own, but it also gets its Chardonnay, Pinot Noir and Pinot Meunier berries from an area of 300 hectares from across 40 crus in the Champagne region. One of its most remarkable plots is the Clos Saint-Hilaire single parcel that grows old vine Pinot Noir. The utmost respect for the environment is taken to care for the vines and the soil. This is done with ancestral champagne-making methods like the use of work horses and sheep as a way to increase porosity in the soil and biodiversity in the vineyard. From this exceptional plot comes the Clos Saint-Hilaire cuvée with its name originating from the patron saint of Mareuil-sur-Aÿ. The remarkable care taken in the vineyards extends to the winery where the berries are vinified into divine nectar under the guidance and expertise of Florent Nys, Billecart-Salmon’s Cellar Master who strive to create cuvées that align with the family’s spirit of simplicity and that give moments of pleasure. To bring out the finest expression of the varieties and terroir, the grape must undergoes cold settling in which it settles for a period of time in the vats so that the solids can sink to the bottom. Afterwards, the juice goes through fermentation in stainless steel tanks at a low temperature to preserve the purity of the fruit, or it is fermented in one of the more than 400 small or 24 large oak casks to reveal the richness and aromatic complexity of the wine. Billecart-Salmon carries out vinification separately for each cru and for each grape variety so that the nuances of each terroir shines through in its wines. 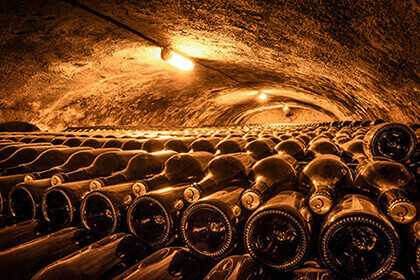 Once the wines have gotten their sparkle after secondary fermentation, they are then sent to age in a vast network of cool, dark chalk cellars that date back to the seventeenth and nineteenth centuries. This is where the personality of the House’s champagne evolve with all the finesse, balance and elegance that epitomize Billecart-Salmon champagnes. Once time has played its role, each cuvée gets a touch of liqueur d’expédition to enhance those refined qualities that can only belong to Billecart-Salmon Champagne. For two centuries, Billecart-Salmon Champagne continues to deliver its promise of finesse, balance and elegance in each of its champagnes vintage after vintage. The Billecart-Salmon Brut Rosé is a celebration of the finest crus that gives a blend of 40% Chardonnay, 30% Pinot Noir, and 30% Pinot Meunier with a 9g/l dosage and 24 months of ageing. The elegant bouquet reveals delicate red berry and citrus zest aromas while the palate offers light flavours and a fresh finish ending with raspberry notes. It is indeed a benchmark among rosé champagnes. The Billecart-Salmon Brut Reserve is an ode to balance and harmony that is a blend of 30% Pinot Noir, 30% Chardonnay, and 40% Pinot Meunier with an 8 g/l dosage and 30 months of ageing. The nose gives fresh floral aromas along with fresh fruit and ripe pear while the palate reveals complexity from ageing. The Decanter wine guide considers the Billecart-Salmon Brut Reserve as the “World’s Best Brut”. The Billecart-Salmon Blanc de Blanc Grand Cru is an exquisite testimony to the Grand Cru villages of the Côte des Blancs. It is 100% Chardonnay with a dosage of 8 g/l and has undergone 4 to 5 years of ageing. The bouquet bursts with dry fruit, almond and hazelnut aromas with a touch of white fleshy fruit. The palate expresses creaminess and buttered brioche with mineral notes and ends with a persistent and elegant finish. The Billecart-Salmon Brut Sous Bois is a beautifully oak-aged champagne with a blend of Chardonnay, Pinot Noir and Pinot Meunier in equal proportions. It has a dosage of 7 g/l with 6 to 7 years of ageing. It is rich and expressive on the nose with dry fruit, fresh citrus and white fleshy fruit along with buttery notes. The oak ageing gives a palate bursting with grilled brioche and toffee flavours. The Cuvée Louis Brut Blanc de Blancs is a tribute to Louis Salmon, Elisabeth Salmon’s brother, who devoted himself to oenology and to establishing the House’s wines from its earliest beginnings. This 100% Chardonnay vintage champagne comes from the Grand Cru vineyards of the Côtes des Blancs, and undergoes ten years of ageing to give it a beautiful complexity. The 2006 vintage has a nose that is both subtle yet complex with white flowers, citrus and whipped cream notes, as well as with mineral aromas from its chalky terroir. The palate has a creamy texture balanced with lemon zest, peach and white pepper flavours. As a tribute to the House’s founder, the Cuvée Nicolas François Brut was created in 1964, and it is another vintage champagne that has extensive ageing before being released. The 2006 vintage is a blend of 60% Pinot Noir and 40% Chardonnay. The complex yet refreshing aromas offer honey and stone fruit notes with a hint of citrus zest. The palate blossoms into peach preserves and apple tart with notes of fresh fig that balance elegantly with its mineral notes. Finally, the Le Clos Saint-Hilaire Brut is the pièce de résistance made exclusively from a unique one-hectare parcel of old Pinot Noir vines from Maueuil-sur-Aÿ. There is no dosage so that Pinot Noir’s character can shine through in the vintage. The cuvée is completely vinified in oak casks and can have more than ten years of ageing! This limited release champagne with no more than 3,500 to 7,500 numbered bottles is only made in the very best of years. An extraordinary Blanc de Noirs and timeless classic. Nothing but the purest forms of pleasure radiate from the finest bubbles as they spiral upwards through shimmering shades of pale pink or gold in a champagne from the House of Billecart-Salmon. Enchantingly timeless classics that have been perfected over two hundred years dedicated to quality and excellence.